Squid Fishing, shouldnt it be Squid-ing?? So yeah didnt I just introduce a philosophical question there, should we not in fact call squid fishing, squiding? After all, can we really call a squid a fish? Of course its not quite a fish, neither is crab but we still call it crab fishing! (Though maybe you may have heard of crabbing too?) So its up there with the mysteries of the Milky Way but hey call it what you will squid fishing is pretty cool. Squid are of various varieties obviously, they exist in many parts of our seas and of course they do exist in tropical seas. I have seen many types of squid fishing but let me start with the kind I have done myself. Squid fishing in the tropics is best done at night, not to say you cant do it in the day time, cos I have actually seen squid being caught in daylight, but at night there is one important weapon that helps you to catch squid in droves. That's right droves. So its almost ironic right, you would think that day time, with the ultimate light source beaming a.k.a. the sun, squid fishing would be better but I suppose its that ability to concentrate a strong source of light in one spot at night that helps to bring all the squid together. This trick is being used perhaps in all seas of the world. So, once you have the light source you still need a way to bait the squid. When using rod and reel (and actually you can do with just fishing line and something to twirl it around), basically is about jigging your bait at a certain depth, preferably with some strong light shining at the spot, at night and at a spot where squid are known to be. Quite a few factors there, but with a fishing guide, you should be good to go. Its literally a slow and steady jerking action of your line. You will feel a distinct tug and pull which is quite different from the bite of a fish. The struggle will trigger you to reel in and with a bit of luck you will miss any squid ink getting shot at you. So whats the bait? Well the favored method is using an artificial lure. This specific kind of lure looks like a shinyshrimp thingy. Now, who figured this stuff works is one of the amazing wonders of the world. This shrimp thingy will have either one ring of hooks on the end or it may have another ring or two down its body. These ring of hooks will help to snag the tentacles of the squid and that's how you catch them. Its also possible to use raw fish bait. There are various contraptions that can help you. There is one which is basically a short metal rod with the ring of hooks on the end. What you do is, stick a bait fish into the metal rod and you use this to jig in the same way. Another style is similar but instead of a metal rod, there is a metal pocket almost where you stuff your raw bait in. Below it again is the ring of hooks (looks like a flower really). So this, and perhaps a little weight or sinker is all you need. If you got yourself a good light and a good fish guide, you will for sure go home with a sack of squid! Sometimes though, all you really need is the light. There was one time I went to hang out at a beach with some friends. Happened that I brought my rod and reel and had that trusty shiny shrimp lure thingy. This island had a decent pier and in fact one night some people were fishing there. I decided to give it a go as well. The guys fishing there were not catching anything and so I just kinda decided to try the squid lure. Squid fishing on a pier! ?, Yeah I figure I was nuts too but what the hey, who knows it might just work right? So happened that a ship was coming in as well and it happened to have really bright light. Following my instincts I flung the lure where the light was shining and did the usual jerking action distinctive of squid fishing. Lo and behold, not a few minutes later I feel that unmistakable tug and indeed I had a squid wrapped around that ring of hooks! Holy Cow it was almost amazing. Threw the lure a couple more times and got a couple more. By that time, the guys that were there started to switch to squid lures too haha :). Well, Squid fishing can be anywhere I guess! Elsewhere, squid is caught much in the same way. Off the coast of south Africa and the great squid fishing fishermen of Mexico that catch those huge Humboldt Squid, they all use the jerk with a light method. Still there are other interesting methods as well. 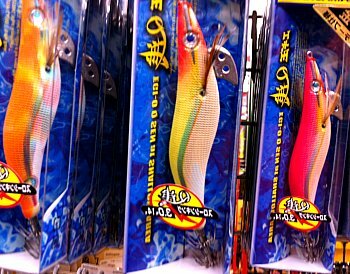 I once saw a Japanese trawler (TV obviously) that had dark red lures with hooks, and these were going into the sea in long lines. Once a certain depth was reached, they simply pulled the lines back up (all automated) and streams of squid would basically be brought on board. Apparently the dark red lures fools the squid to think that they are mates ready to procreate! So instead of the kiss of love, they got fooled into a kiss of death. Nasty squid fishing for you! Another industrial style squid fishing I have seen, off the coast of California I believe, the fishermen there still use the strong light method but instead of using lines of hooks, they simply use a huge net and just trap all the squid in one go. What an efficient way to kill off the species! Well we are human I guess, we take as long as there is something to give. Having said that, its a fisherman's livelihood, I just hope they have the regulations to ensure there will be still squid in those parts in the future!